Microsoft has launched its new gaming console, the Xbox One X in June 2017 at the Entertainment Expo. The Xbox One X, Microsoft’s much awaited Project Scorpio is touted to be the world’s first true 4K gaming console. The console will be available to buy in the US from November 7 for $499 (Rs 32,000). At the same time, the company announced a limited period Xbox One X Project Scorpio Edition for consumers who’d prefer a more cosmetically enhanced version of the Xbox One Day One Edition. 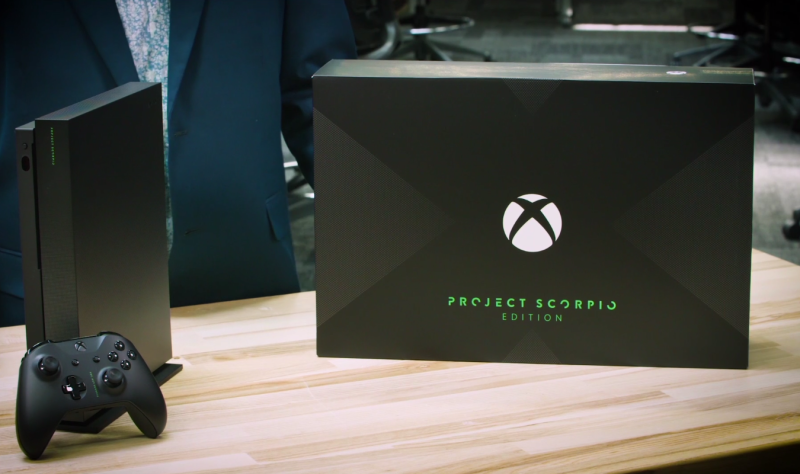 The limited edition console, as mentioned earlier, features a slightly more gradient design, and the Project Scorpio code name etched on both the console as well on the controller. Microsoft confirmed that all initial Xbox One X units up for grabs will be a Project Scorpio Edition, and will sell for the same price as the Xbox One Day One Edition. The Xbox One X is a mid-cycle Xbox refresh from Microsoft but, has enough horsepower under the hood to grant it the label of being the most powerful gaming console in the world when it arrives in November. Since the new console runs on the Scorpio engine, it is backward compatible to run all 900px and 1080px Xbox one and 360 titles at upscaled 4K. Which means all existing Xbox One titles should look better on the Xbox One X due to enhanced visual fidelity, anisotropic filtering, and faster loading times. The new console will also work with all current Xbox One accessories, Microsoft has confirmed. 4K will largely be the buzzword, all Scorpio-exclusive games will super sample down to 1080p and all Scorpio-exclusive game modes will be available for all users regardless of their display. Technically, players will not require a 4K-ready monitor to use the Xbox One X. The console will use supersampling to improve visuals on 1080p screens while offering true 4K UHD playback on 4K screens.